What does 21st century learning look like from where we are?? What does the future hold? 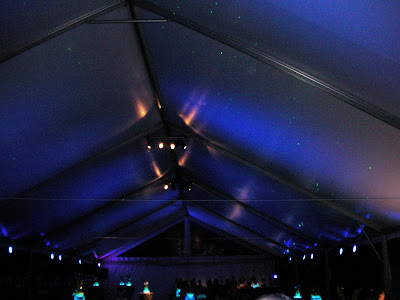 - this somewhat unusual photograph showing the ceiling of the tent at the Opening Reception for the 2008 National Education Conference. The more you look the more you see, twinkling moving green spots of lights, the areas of blue light moving around - a form of endless ever moving horizon - clever idea! A small group of us sat down yesterday to a) reflect on the massive journey we have been on in the past two and a half years, b) identify the successes we have already achieved and c) start to consider what learning will look / should look like as move towards the future. Inevitably we spent ages talking about teaching and learning styles, the massive professional development issues, recruitment and induction of staff in this fairly transient teaching population and the changing role of leadership. 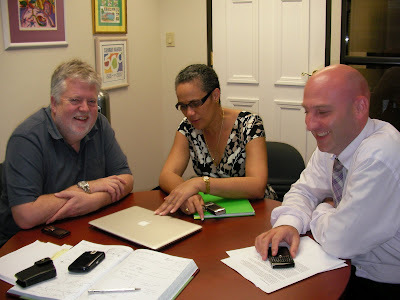 With Professor Stephen Heppell with us how could we not also vitally discuss the complete integtration of technology for learning throughout the country, as we move towards the concept of 'Campus Cayman' - a learning country. We also have a good number of professionals within our system who can offer the benefit of what the past two years has been like for them and identify what we learn from them, especially as we move towards our new secondary campuses in particular. This is particularly true of our School Leaders who helped lead the charge from one massive secondary school to the creation of four small schools on one campus - the 'schools within schools' model. Whilst there is no doubt that over the past eighteen months it has transformed the learning and school experience for stuidents, staff and parents, the staff have much experience to offer as we develop this model further on the new campuses. Many developments take place around the world without using their own professional resources - we mustn't make the same mistake. These conversations are so stimulating, and given the holistic approach we have taken as a country, this confirms my belief that I really do currently have one of the best jobs around in education - no question!. Three of the discussion group: Professor Stepehen Heppell, Ministry Chief Officer; Mrs Angela Martins and Deputy Chief Officer; Mr Vaughan Carter try unsuccessfully to forget the camera as I take the photo. Professor Heppell, plus the new Mac Book 'Air' equals excitement!! 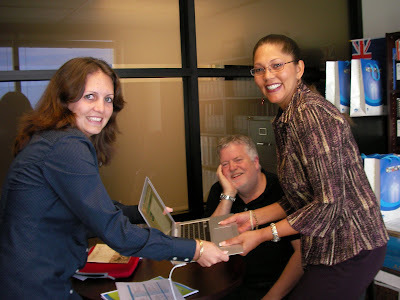 Ministry staff Kim (Research Analyist) and Gina (Deputy Corporate Communications Manager) 'fighting' over the new laptop watched by Professor Stephen Heppell. There were several others who wanted to look at it during the day but I always always keep Stephen and all other visitors very busy from the moment they land to the moment they leave ... including only doing working lunches and usually dinners as well. Therefore the game became not hunt the "Air" but hunt me first to then find the Professor so they could then find the 'Air'. The hunt will continue tomorrow I suspect! It is a great machine - I wonder how long before the the other makers follow suit in slimness and weight? When they do I suspect that the Mac's will be slimmer still! 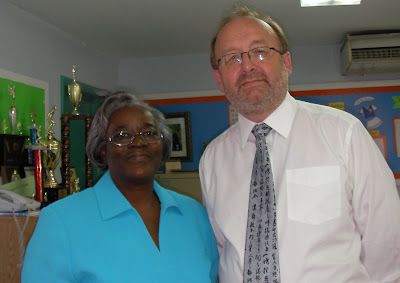 How far we have travelled in education transformation, in such a short space of time, was really brought home to me again over the past two days as I visted schools and worked with the Chief Education Officer of Montserrat; Ms Kathleen Greenaway. Faced with the ongoing consequences of the volcano disaster and the huge impact on the lives of islanders, education reform has not necessarily been the priority for many people. As we considered the transformation journey that the Cayman Islands has undertaken, I was pleased to be able to reinforce the fact that many of the changes we have undertaken come at little or no cost. The focus of the student being at the centre of the education service, and improving teaching and learning to give them the skills they need to be global citizens, can be undertaken by anyone. The cost of the many new 21st century facilities we are building really is a bonus that will enhance the learning process but is NOT the cause for new learning styles. Many people seem to get confused by this concept! In several blog posts and media articles recently I have noticed teachers and, even more embarrassingly, headteachers note that they cannot wait to get into their new buildings so that they can start to learn to use more exciting teaching techniques. What they actually need to be doing is learning to develop a whole range of teaching skills now so that they are totally confident in using them whatever the facility opportunities or limitations. The building does not cause good teaching and learning but it can enhance it. 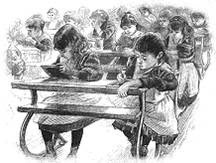 There is some talk of the new 'Schools of the Future' not working - whatever that means. It could well mean that the new facilities don't let people keep doing the "same old same old", which can only be good!. In many cases the whole design and build process has been done in total isolation of students and staff, apart from vague images. The actual professional development needed for all adults working in new spaces (not just teachers) to achieve 21st century learning should start now. For those people who are lucky enough to get new facilities - the professional development must start immediately the concepts are considered and have a generous enough budget to facilitate the opportunities for all. The financial figure will still be minimal when compared to the cost of the building. Failure to prioritise this will result in the new facility failing to achieve its potential for the students - who must be the priority. People would be crazy not to focus on this aspect! Improving literacy - Helen Tse's generosity and commitment to our young people. l-r: His Excellency the Governor; Mr Stuart Jack and Mrs Jack, Chief Education Officer; Mrs Shirley Wahler, Chief Officer in the Ministry of Education; Mrs Angela Martins, Helen Tse and yours truely. Promoting literacy amongst our students is a real priority, as it is in many countries. We have been really fortunate that, amongst our residents is attorney and best selling author Helen Tse. Helen is a friend of mine who has made an incredible personal investment to our young people. Her book "Sweet Mandarin", although recently published is already in over thirty countries with a major launch in the States later this year. It is also already an exam set book on some courses. Helen, in conjuction with law firm Walkers, her employers, launched a literacy prize for all our secondary students. She gave up many hours and ran many workshops in schools about how she came to write her book, based on three generations of women in her family. She also really encouraged students to write their own story as a competition entry. The prize; apart from her book etc, was a workshop with Helen and support for them in trying to write their own story with the hope that it will also be published. I was fortunate enough to represent the Ministry at the award ceremony on Saturday, along with His Excellency the Governor and Chief Officer of the Ministry. This competition really captured the imagination of our young people, including many boys, attracting a staggering entry of over 1,200 stories - a massive response! This also proved how inspiring and effective Helen's presentations were and how motivated students were. The entries reflected the relevance that students felt in the task and the great interest in their personal writing, all on the same subject of 'their family'. No one expected this scale of response - a huge hit which has produced some outstanding and inspiring writing! I hope we learn from this and continue to inspire and celebrate creative writing for all ages - it is not the secondary taboo that some think. Several students have noted that they thought that this was one of their best pieces of work they have ever done! We need to yet again learn from this as we continue to move our teaching and learning skills forward - thanks Helen - just amazing! 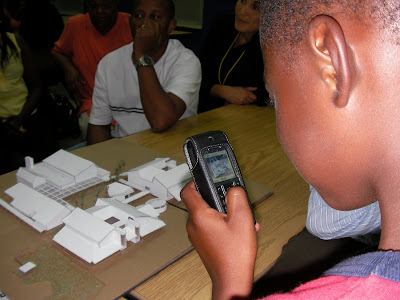 21st century education - "Will the new school be made of cardboard?" I accompanied the Hon. Minister to a parents meeting last week, along with our architects (CS&P) the other night, when we shared more exciting and innovative designs and discussions about the new primary school we are building. (The photo above shows the Minister talking and joking to just a tiny fraction of the audience). Writing his briefing notes prior to the event reminded me just how well the whole team is working together and how much we are achieving in a really short space of time. The timescale for this project is extremely aggressive! This was a great evening and just part of an ongoing series of meetings and events designed to really involve students, staff, parents and the community in what will be their new unique community primary school. It really is a model of good practice! Natural Learning Zones - a great example! No deep 'meaningful' comments (or not) in this post - just one photograph from a pre school I visited today with a nature / butterfly garden. It is regularly used in a variety of ways during the course of each day - quiet reflective areas, sensory space, nature learning zone, stimulus for literacy ideas, creative play and so more more. I particularly liked the attention to detail with different types of paths, (including slats, natural stepping stones), group areas, variety of planting, etc. 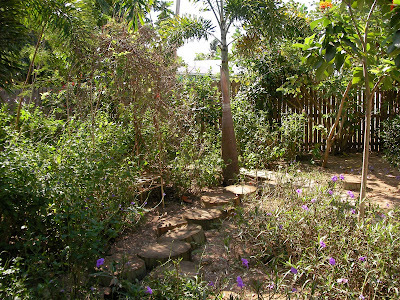 As you approach it, it looks as though it is a largish space - it is in fact quite small, very secure and visibility to all areas is not a problem due to clever planting. As I work this week with architects (CS&P) developing plans for a new 21st century primary school this garden is just one of the best examples I have seen recently! That's all! 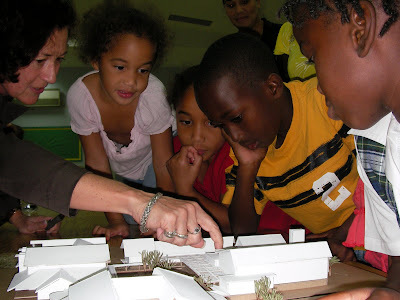 In transforming the education service in the Cayman Islands the fundamental accepted belief is that students will be at the centre of the system and that all services should be designed to support all students achieving their potential. Therefore the strategic decision taken was to split the Cayman Islands into a series of 'Learning Communities' filled with support services to enhance student learning, support schools and reinforce the importance of the student. What has also happened is the creation of a number of teams of professional colleagues with a variety of different skills designed to work together for the first time from what was previously a series of unconnected services, all focused on helping students. The future plan is that, once the three new secondary campuses currently being built each in a different district of the country are completed, these teams will be based within the new campuses but also support the primary schools within their district. This will ensure real relationships developing with students, parents, teachers, schools and encourage a real focus on supporting learning!! The photograph above shows the "Western District' team including the Learning Community Leader (not shown), ICT technician, Educational Psychologist, Speech and Language Therapist, Occupational Health Therapist, Facilities Co-ordinator, Attendance Officer and Head of ICT Support Services. Whilst this is the first time that they have met as a team, everyone thought the meeting was incredibly useful and the start of real collaboration between a whole range of services - all designed to support students learning. This team approach, with a myriad of services all REALLY talking to each other, although in its early stages, could well become a really good model for the future in ensuring a joint multidisciplinary approach to supporting students! "We're not feeling it!" - students challenging their own work ideas. Working with some year 9 students on an Internship programme in the Ministry this week has yet again demonstrated that students being allowed to work collaboratively can be really effective. During their three and a half hour visit this week they undertook a real 'start from scratch' design and production task, for public presentation by the Ministry. Watching them come up with the approach, challenging each others ideas, setting themselves ever increasing / higher standards, selecting appropriate software, considering how to best incorporate the Ministry 'brand' and then asking our Head of Corporate Communications for his professional design critique prior to completion demonstrated a really mature and professional attitude. They rejected ideas as not being appropriate for the target group involved, or not being sophisticated enough to be a Ministry product and also because "we're not feeling it" about one specific idea. Not only did they complete this 'real' task, they also did it within a really aggressive time scale - something which rather alarmed our design professional who admitted it would have taken him much longer! Any good teacher already knows that this collaborative approach works really effectively for a range of tasks and projects and can really contribute to raising standards. Individually, by their own admission, these two students would not have come up with anywhere near such a good high quality product. To those who question how each person's contribution is assessed - just watch them work and also look at their 'on line' portfolio and self evaluation blogs - they are incredibly different, record a range of developmental stages and reflect a range of different evaluation skills. The students also noted that they clearly understood the objectives, saw the relevence of what they were doing and knew how they were going to be evaluated. Why are there some teachers who still do not ever use this approach and really avoid trying it? No idea - it just does not make any sense and I have met these in evey school I have ever worked in (here and the UK)? If we are really going to try and transform teaching in all schools, whereever they are, the full range of teaching and student learning techniques really must be identified, developed, trialled, supported, modelled, implemented, evaluated and developed again. People also talk about identifying good practice as being an important aspect but doing that doesn't mean that other staff can actually just watch and then do it - hence the modelling, coaching and supportive approach. (Potentially a subject for a whole new post). Still rarely adopted is asking students to get involved in ideas for approaches to learning techniques for specific projects, lessons etc - they can produce really exciting ideas. They DO know and care about their learning and I have seen teachers who use this approach frequently agree that their students have better more sophisticated ideas about how to tackle work than they were expecting. The approach that the interns took on the challenge for the Ministry task, and resulting product was, frankly, better than we expected as well... I thought I had high expectations... obviously, in this case they still weren't high enough either! The internship programme run by this school, ('Learning Through Internship' - LTI), now in its second year, gives students REAL experience of the work place and has proved extremely successful in motivating a large number of students, giving them ideas about careers, increasing their confidence generally and giving some relevence to achieve success at school - not just because their teacher or parent told them to. (Last year some students formed long term relationships with their employers, with vacation jobs, promises of potential employment and talk of the possibility of support for college / university courses if they maintained their attitude, work ethic and so on). There are still those education professionals that think the Grade 9 students are too young for this programme - I totally disagree. One did argue with me with the bizarre comment that it would 'spoil' the extended work experience for Grade 11. Nonsense - what employers will be getting then are more prepared and aware students who will expect ever better quality work placement opportunities. There is clear evidence it the scheme has helped a large number of students really focus - you can't argue with that! (For a link to a brief media report on LTI click on: 'Learning Through Internship'. 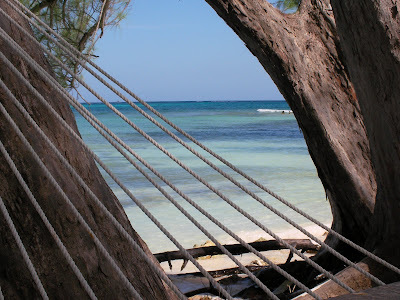 As I lay on a hammock at Rum Point today, I thought about the week that has just gone by.... and that the message about thinking about how we deliver education for the 21st century is beginning to get through in the Cayman Islands. At a senior staff meeting at one school on Friday I heard staff talking about quality of teaching and learning in their school.. and ensuring that staff get sufficient support, coaching, modelling and training - all the right responses. This from a school where, not that long ago, approaches to teaching was not really ever discussed. They were also talking about ICT integration into the new curriculum. 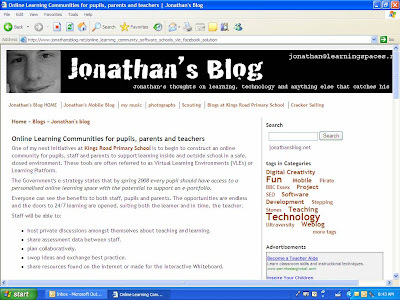 Another school was incredibly excited about its increasing ICT integration including a blog that it was currently developing that would serve numerous purposes, communicating to parents, highlight students work, increase community involvment and link with international partners. (I hope to help them with this later next week.) There were many other sucesses this week as well - these are just two. Whilst most of my work is national strategy, it does also include implementation. It is great when I can get involved in a school, interact with staff and students and begin to see the real positive impact on students learning - they really must be at the centre of every decision made! Reflecting on all this, albeit in a hammock, it really summed up a pretty good week - the hammock completed it in style ! 21st Century Education - No - "What we do is".........Aaaaaah!!!! No one seemed to link these statements with the fact that their students have been massively underperforming for years "doing it that way" and achieving no where near their potential. The professional journey that teachers have to go on is huge as we move towards what is being called 21st century education. (Some teachers don't appear to realise we are in that century yet!). Talking to colleagues in the UK and the USA, where it appears to be also true, the message seems to be that education authorities are not approaching this professional development issue anywhere near early enough with insufficent 'buy in' from the very start from the very people who have to work in new learning environments . The dilemma often revolves around the issue that some teachers who are stressed / have low morale hear people talking about new styles of teaching and learning, 21st century schools and simply see more work for them without really being motivated to explore the very exciting possiblities. Add to that the real fear that some staff have of their lack of technological skills when compared to the students they teach and it can become very daunting. Most staff, where ever they, are usually excited by new buildings but can be nervous about what they mean for their own practice. A few vocal teachers can then always argue that 'the kids are the same and they will not change' and 'lets talk about behavoiur'. There is significant research that shows that students behave differently in new envirnoments, especially those that demonstrate respect for the students and provide a range of formal and informal meeting places. It is THEN that the teachers really have to change their practice so maximise the benefits of the new environments for learning, making full use of the techology and help engage the students. What many don't really know is HOW to do WHAT? 'Same old same old' will not work!This conversation is quite major and should be acccompanied by early planning, modelling, coaching, collaborative working etc so everyone gains confidence in expanding their professional practice. Only when this is really done, in plenty of time(! ), will the impact on results be as significant as they should be. Equipping a Classroom of the Future - an interesting debate. I came across a really good blog post recently from 'Intrepiteacher' as he describes what he considers should be in the 'Classroom of the Future' in his school in Qatar. 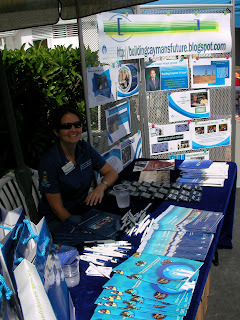 Of course technology reigns, but her in the Cayman Islands, as we move on to consider equipping our new campuses it is a useful article to throw into the debate, and certainly one worth sharing. The list he describes in his post is comprehensive and probably ambitious, but used in the context of flexible learning spaces (and NOT traditional classrooms) it begins to make more sense. We're not talking about twenty five students in 'cells' for thirty five minutes any more but about groups of students involved with integrated learning, collaboration and longer lessons. Of course, as ever, a key issue within a learning environment like this, is recruiting / training the staff to function in it to its maximum effectiveness. As I have said in different posts and conferences, the lack of staff technical awareness is frequently negatively impacting students learning as teachers can't cope with the technology - which is how students want and expect to learn. This challenge has to be addressed by most places much earlier and much more quickly if we are REALLY going to change the way we do business! A really interesting post here by Intrepiteacher'. Teacher versus Educator - they are not the same! Vocabulary is really important as we move to transform education systems every where. Parents and teachers know how they were taught and still, in far too many cases, we are replicating that model, even if a few bells and whistles are added. The language of schools brings all the memories and connotations of our own previous experiences. I am getting more and convinced that we need to think about replacing the word teacher with the very American sounding educator. The latter has not really existed in the UK mainstream education vocabulary - we have always talked about teachers and teaching assistants etc. Educator was always linked to the States - but may be they had it right! Even if you search onto Google images for the word 'teacher' (see above), the first images are traditional looking teachers, some standing in front of a blackboard. 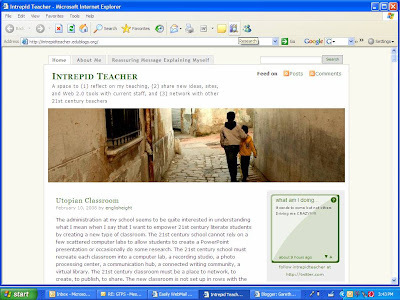 If you search on the word 'educator' one of the first images is of an adult surrounded by student sharing some lesson in a very interactive and collaborative way. (there are , of course exceptions to this). Why am I thinking about this?.... well, maybe rather obviously, from talking to students on their preferred ways of learning - (see two posts below!). They don't want adults standing in front of them lecturing or telling them what precisely to do - they want facilitators to enable them to get involved in a project and continue it 'anytime, anywhere, any how'. They expect to use a range of adults or peers to help them not just ' the supposed expert'. This is reinforced by the increasing use of support staff. No one is denying that there are many aspects (skills) that have to be 'taught', it is what happens next as students use that knowledge to reinforce their learning that is important - it has to be increasingly relevant and students DO need to see why they are learning x or y - and what the objective is. A funny part of the conference this week, was that it was not the Principals or Schools' Inspectorate asking to see the objectives of a lesson - it was the students - resistant teachers are now genuinely beginning to be caught in the middle of inevitable change. Traditionally the teacher was always the expert who imparted knowledge, taught them techniques and helped them communicate what they had learnt. ( a generalisation I know!). Most secondary students (and many younger) these days know where to find the knowledge quickly and without the teacher, but also know that, especially regarding ICT communication techniques, they know more than the 'teacher' - often a lot more. In fact teachers often inhibit the students' use of ICT through ignorance or rules that often make little sense. One student asked this week why we did not use blue tooth technology in lessons - not to show off - he genuinely wanted to know. (The fact that his particular school rather pointlessly bans cell phones is one issue which doesn't help!). As we move to increasingly new collaborative and integrated lessons, which last longer, students want facilitators or educators to work with and guide them. Perhaps the traditional role of the teacher really is disappearing far faster than some would ever believe. If so, the word teacher should disappear also, and soon! Getting the message out - even to the cows! New experiences for me this week at yet another 'road show'. To really get the message out to as many of the community as possible we have been putting up displays at a range of popular public functions. The annual Agriculture Show attracted thousands of attendees today, especially as it is the Ash Wednesday public holiday - hence we had a display there with masses of information to give to all interested people. I've done loads of these, but never before as we discuss transformation of the education service have I had cows mooing, goats bleating, chickens making whatever noise they make and goodness knows what else in the background as well as well as the music. What is important though is that we get the message out when ever and where ever to maximise community involvement. Getting students to talk about their learning is so much more powerful than adults trying to persuade or lecturing staff. During a professional development day a group of high school students (all ages all abilities) faced their toughest audience yet by speaking to over two hundred teachers about work that they found rigourous! Some also talked about their preferred learning styles and shared projects they thought really worked. One student basically told teachers to 'get into the real world and join the 21st century'. the fact was clearly made that they wanted to be comfortable when they worked - more relaxed seating forms with music at times. With out briefing he talked about not liking being crammed into "box like rooms" and endlessly lectured. .What also came across clearly was how articulate most were about their learning, many had the audience in gales of laughter at times, but they also were determined to get their point across. They were really talking about learning anytime, anyplace, anywhere! .There were also clear negative points where students talked about working to produce something they were proud of and then not being able to share it, or having presentations cancelled and generally not having their efforts recognised or valued. I sat there wondering, with the presenters, that despite hearing the students voices, how many teachers actually took on board the actual meaning of what they were saying - they were pretty blunt at times! If they did hear it , how are they going to change practice to help students learn how they want to? Many teachers thought it was an excellent session, the first time that we have done this exercise on such a scale and just the start of several sessions. There were also some teachers who found the session uncomfortable. It is, after all, not how they were trained with students challenging teaching styles. It is, however, what the future looks like and it is teachers who are going to have take this change journey if we are really going to engage our young learners. (ps: maybe one of the most memorable quotes was one students who noted that he "sometimes went back to the old ways and used a book". Whilst lots of people laughed there was a very clear message here!). 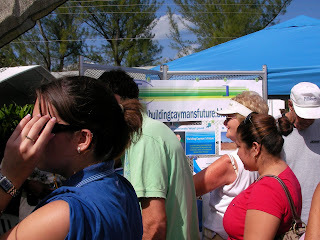 People really do want to know about our 21st century education tranformation..
At a public art display this weekend we put up a whole display about the education transformation work that we are undertaking in the Cayman Islands. 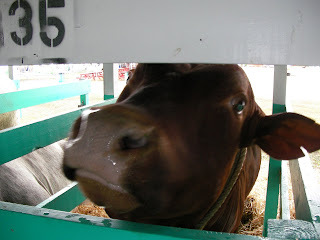 We hoped that at least some people would stop by for a look even though it was not the art they had come to see. Equally rewarding however were the numerous comments about how good the transformation was, how overdue it was and how delighted they were that this Minister was so passionate about improving the system for every student! Many of the people who picked up details had not seen them before despite all our commuincation efforts, through leaflets, blogs etc. This exhibition day really helped spread the word about what we are trying to do to position our education system to prepare our students to fully integrate into the 21st century global workforce. We repeat this exercise again later this week at the hugely popular Agricultural Show which takes place on our Ash Wednesday public holiday. The more people from all aspects of the community engaged in our education system the better for the long term development of this country. 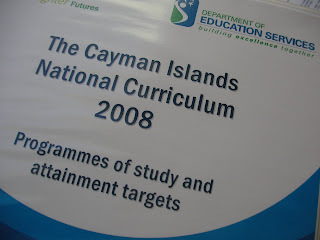 I attended the hand over of the new Cayman Islands National Curriculum yesterday. 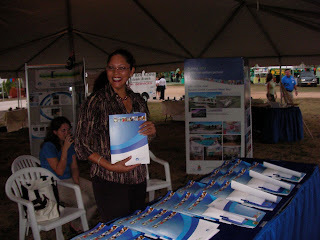 The new curriculum was handed over to the Hon. Minister by the team that steered the development of it, led by Mrs Helena McVeigh, Chief Inspector of Schools. This has been a massive piece of work and I am so impressed by the breadth and detail that it contains, all achieved within a tightly prescribed timescale. The time scale has not affected the quality but reflects a passion and commitment to achieving thbe very highest standards. 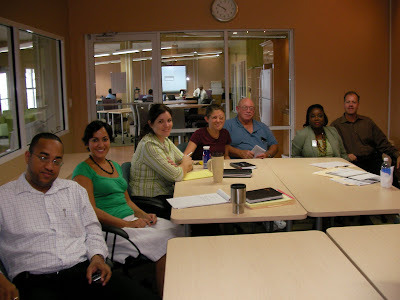 Local educators, local national curriculum, international expectations was the focus - there is great potential in Cayman and the provision of two Curriculum Development Officers to help steer the task and do the international research meant that we could do this within our system and not rely on overseas consultants. This straight away gives it more credibility. Add to that the involvement of approximately sixty of our teachers gives added credibility. This document will not sit on the shelf - mandatory implentation is September with many schools piloting it now. The implementation will be closely monitored and evaluated. This is a major step in Cayman education that was requested by teachers and not imposed from above. Well done to the team - a great piece of work.